The word “bacchetta” comes from Italian, and it means “stick,” but in a sporty sort of sense of the word (go figure). One look at the spare monotube frame design of these bikes will tell you where that notion comes from. The correct Italian pronunciation is with a hard “ch,” like bak-KET-ta, but since everyone pronounced it like “ba-SHET-ta” even the manufacturer started saying it that way. Here in Texas we hear a few people asking about a “ba-CHET-tee” (like “cheddar cheese”). So just pronounce it however you like. We’ll know what you’re looking for. 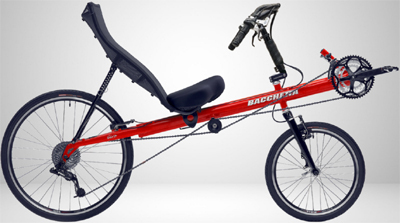 Bacchetta short wheelbase bikes are meant to be ridden in a reclined position. You can set the seat more upright, but the best weight distribution and handling comes farther back. You get a choice of seats on any of their bikes. The classic ReCurve seat is better for upright positions and people with larger hips. The innovative EuroMesh seat is ideal for smaller riders and deeper reclines. For highest performance, the Carbon shell seat is the lightest and stiffest. Any model of bike can mount any seat. The really novel design feature about these bikes is the extruded main frame tube. This is not a round tube, but an egg-shaped cross-section (see the logo above). This puts stiffness where it is needed, keeping the frame simple and light. 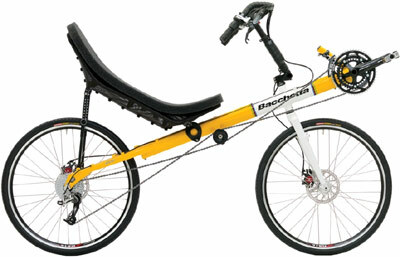 Previously, recumbents either had a “triangulated” frame, built from several tubes welded together, or a round tube “monotube” style. But traditional monotube frames could be flexy under heavy pedaling, leading to thicker gauge tubing. Triangulated frames required extra materials and labor to build. Another novel feature (not so novel any more) is the over/under chain idler. This design allowed for a simpler, less expensive frame design with a major improvement in aerodynamics. On the down side, it created more drag in the drivetrain. 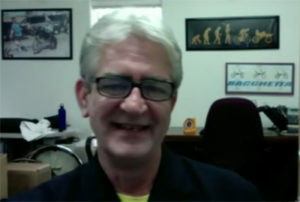 Bacchetta’s founder Mark Colliton had done independent design work for several recumbent bike makers, and he was so sure of this innovation that he started his own company to run with it. 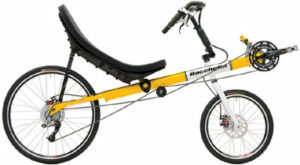 The over/under idler design is now a common sight on many performance short wheelbase bikes. Another development that Bacchetta drove to the market is the open-cockpit handlebar design. The steering riser meets the handlebars ahead of your knees’ apex. The bars then reach around outside your knees. Your arms stay extended, which is both more comfortable and more aerodynamic. Open-cockpit isn’t as maneuverable as the classic over seat steering design (the “praying hamster”), but works better pointed down a highway.